Disclosure: My invite to preview of the Dark Arts at Hogwarts Castle show was complimentary, but all thoughts and opinions are my own. Ride Harry Potter and the Forbidden Journey – This is the main attraction in The Wizarding World of Harry Potter, so it’s the most likely to get long lines. I recommend heading to this at park opening to avoid wait times. The queue line is an attraction in and of itself, so having not many people in line will help you get better photos and videos of the queue! Have breakfast at Three Broomsticks – Three Broomsticks is the quick service restaurant in Hogsmeade. The inside of the restaurant is absolutely stunning, so much so I have often spent an hour enjoying my meal and the atmosphere! I think their breakfast is their best meal (I love their scones especially), so I highly recommend doing that! Three Broomsticks also tends to be less crowded in the morning versus lunch. Get an interactive wand to cast spells throughout Hogsmeade – The line for wands can also get long, so I recommend getting your wand, experiencing Olivanders, and going throughout Hogsmeade to cast spells earlier in the day along with Three Broomsticks and Forbidden Journey as your morning activities. Ride Flight of the Hippogriff – The line for this roller coaster tends to not get very long, so you don’t have to try to go on it immediately like with Forbidden Journey. It typically is no longer than 30 minutes, but it couldn’t hurt to go on the earlier side for an even shorter line. When you ride on the coaster, there are beautiful views of the Wizarding World, so I love having time to go on it more than once. Try Butterbeer ice cream – Butterbeer ice cream was just released last year at Three Broomsticks as well as food carts in The Wizarding World, and it is SO delicious! It tastes somewhat like a rootbeer float but in ice cream form…but even better! Definitely my favorite treat offering. Get enchanting photos in less crowded areas of The Wizarding World – The main walkways of course always have foot traffic, which isn’t ideal “for the gram”. However, there are some less crowded spots that are off the main walkways that make for enchanting photo ops. One spot is behind Honeydukes, which only leads to an employee entrance so there isn’t any foot traffic aside from the occasional employee. Another great spot is the gate to the left of the Hogsmeade Station shop. It’s a wide open area, and if you catch your shot at the moment there’s smoke coming out of the bottom of the gate it looks very enchanting! Another great spot is the archway next to the stack of cauldrons, which is down the alley to the right of the shops. A spot I love for a shot of Hogwarts Castle is adjacent to the outdoor eating area of Three Broomsticks. When you enter the outdoor seating area behind Three Broomsticks, go to your left till you hit the end of the walkway, and there’s a great spot where no one really goes, unless there’s an extended line for Olivanders. Go into Honeydukes – Whether you’re in the mood for a sweet treat or not, a visit to Honeydukes is a must. It’s so immersive, and the treats look like they are straight out of Harry Potter books. It is definitely a great place to stop for the full immersive Hogsmeade experience. Get a wine in Hog’s Head – Hog’s Head is the pub adjacent to Three Broomsticks, where you can enjoy a glass of wine. It truly feels like you’re in a pub or tavern in another land, so it’s a great place to relax and unwind in the late afternoon/early evening. Explore the shops in The Wizarding World of Harry Potter – The shops are full of hidden surprises and interactive elements. The inside and outside of the stores are true to the Harry Potter setting, really making you feel you’re shopping in Hogsmeade. Plus, they have every items imaginable to sport your house pride (I’m Gryffindor). See the Frog Choir – With performances throughout the day on the stage outside of Hogwarts Castle, this a cappella group of 4 “Hogwarts students” is so incredibly talented! It’s one of my favorite live performances at a theme park. Even though I am a passholder and go frequently to Universal Studios Hollywood, I always love seeing the frog choir! Try a Butterbeer – What would a visit be to The Wizarding World of Harry Potter without trying their signature treat: a Butterbeer! They have frozen and cold Butterbeer stations in a couple spots throughout Hogsmeade, as well as inside Three Broomsticks. The cold version is very tasty with foam on top, and is a little sweeter than the blended frozen version. I enjoy them both, so go with whichever you’re in the mood for! 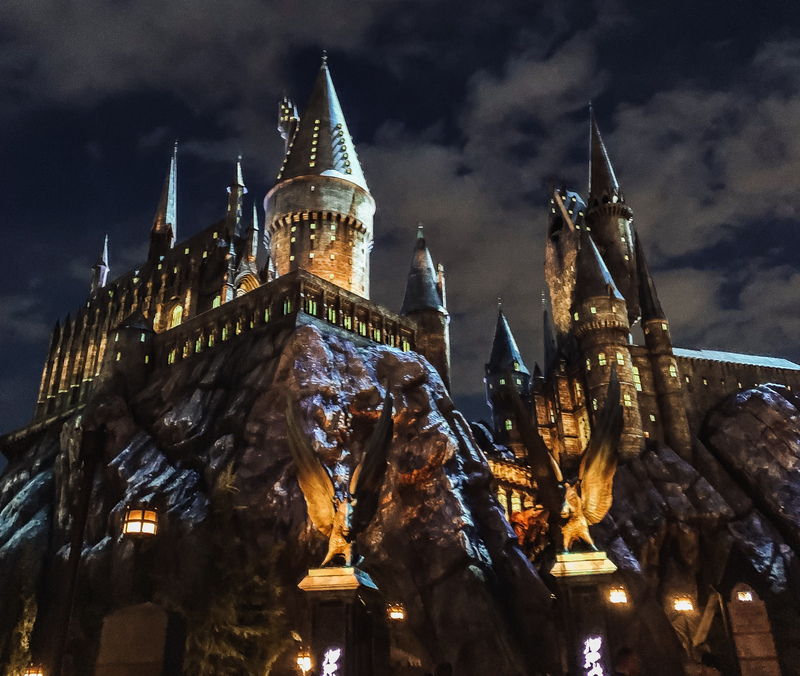 See the new Dark Arts at Hogwarts Castle show – If you’re visiting Universal Studios Hollywood, stop back at Hogsmeade during nighttime to see Hogwarts Castle light up. It’s truly the most magical way to see the castle! Playing April 13-28th, and again May 25-27th, you can see the new Dark Arts at Hogwarts Castle show. The projections are amazing, and is now my top favorite castle show, even topping their Christmas show in my books! Dark Arts at Hogwarts Castle Show is About to Begin! To get more information on visiting The Wizarding World of Harry Potter at Universal Studios, click here. I hope my itinerary and list of things to do at The Wizarding World at Universal Studios Hollywood is a helpful resource in planning your own trip!